It’s always interesting and fun when the countdown hits the Top 19. 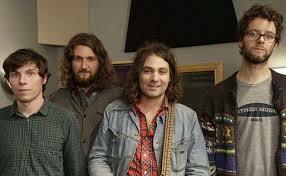 The War On Drugs are a Philadelphia based six-piece that formed back in 2005. Yeah I said indie, however with the release on their latest album Lost In The Dream, the band has turned more mainstream alternative. Founding member Kurt Vile left the band after the release of their debut album and its been all roses ever since. The Lost In The Dream album was named by many reputable publication as the Band Of The Year for 2014, while this blog had it as eleventh best. Two of the tracks from the album placed very well in my Top Tracks Of 2014 countdown, “Red Eyes” came in at #11, and “Under The Pressure” was the #2 track of the year. Every year the organizers of the Coachella Festival misstage an act, meaning their mainstream appeal doesn’t warrant a Gobi or Mojave Tent placement. I find it fun each year to predict the misstaging, The War On Drugs will unfortunately be misstaged. BTW, I made up the word misstage, so I can spell it however I want.